The book collection of the Slavonic Library consists of 800 000 library units, representing a rich palette of Slavistic literature. The collection is based on personal libraries either received as gift or purchased in the early years of the library, most notably the personal library of the first director of the library, Vladimir N. Tukalevskii. Since the late 1920’s, the original focus on the east-Slavonic territory has expanded to all Slavonic literature. The territorial focus also corresponds to the inner division and structure of the collection, divided into eleven geographical departments and two general departments. Since the early 1930s, the acquisitions were carried out systematically according to thematic plan of acquisitions. 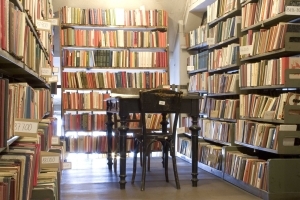 Due to generous funding of the founder, the Ministry of Foreign Affairs of the Czechoslovak Republic, the library was able to carry out extensive retrospective acquisitions, which often included rare and unique personal collections. As a result, the Slavonic Library obtained an extensive collection of manuscripts and early printed books as well as more recent important collections (for instance Smirdin’s Library, Rešetar’s Library of Ragusiana, etc.). After 1945, the library incorporated another important collection – the library and collection of periodicals of the dissolved Russian Historical Archive Abroad (RZIA). The collection of periodicals from the fund of RZIA constitutes the most valuable part of the collection of journals and newspapers of the Slavonic Library. The collection of periodicals of the Slavonic Library is currently expanded by a regular annual acquisition of approximately 370 titles of periodicals. The collection of the Slavonic Library further consists of several collections of special documents of archival, artistic, cartographic, notaphilic or visual nature.